EghtesadOnline: It was important for Iran that its enrichment right to be recognized, and Iran will stay in the nuclear deal as long as its interests are secured, said the Iranian deputy foreign minister. 'Upon feeling that we have not gained what we should have, and they are not loyal to their commitments, we ourselves will decide to act according to our interests; [even] if our benefits entail quitting the deal, we will undoubtedly do so. 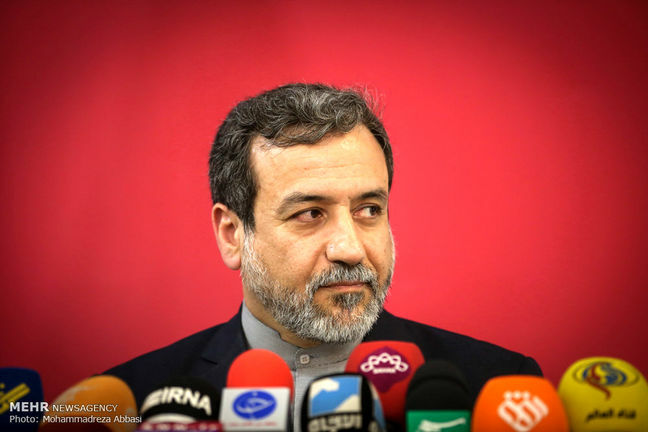 We won't hesitate,' said Abbas Araqchi in a TV program on Monday night. He said that Iran and the international community believe that the deal is beneficial to Iran; we both sell oil and attract investment. 'The investment risk in Iran has improved and changed from six to five, and the international situation has well improved,' Araqchi said. 'The American's look at the JCPOA and say things that are not reflected here [in Iran]; they say Iran has become stronger after the JCPOA, and more aggressive,' he said. Regarding the oil sale, he said that Iran has sold $40 million of oil in the current Iranian year (starting on March 21, 2017). 'The Americans say Iran is doing all it wants. They want to limit the strong Iran; they want to re-impose the shipping, banking, and oil sanction but see that the JCPOA is blocking the way,' Araqchi added. 'I repeat it to prevent any misunderstanding: Iran has never been after the A-bomb and never will be. However, some people think the opposite,' he reiterated. 'The JCPOA is a part of the UN Security Council Resolution 2231 … if trump wants to tear it up, he should tear up a UNSC resolution as a UNSC permanent member,' he said. 'We will under no condition renegotiate the JCPOA... It is by no means related to any other issue: neither the missile program, nor the regional issues, Araqchi said. Hoping that Europe will stay in the deal, he also said that the Europeans have had good stances, but what they will decide in the future is unpredictable. He also said that the Europeans are worried about Iran's missile program. Trump was isolated; he tried hard to make the UNSC at least issue a press release but he could not gain anything, he said. Araqchi said that Iran's policy is crystal clear. Quoting Supreme leader of the Islamic Revolution Ayatollah Seyyed Ali Khamenei, he said that if the US quits the deal, it is natural that there will be JCPOA, and we'll decide according to our own interests. He stressed that Iran is ready for any scenario; some scenarios have been designed and for each an action plan has been devised. He also said that the Supreme leader's advice was always considered all though the talks, and when his conditions were taken into consideration, he allowed the implementation of the deal.